After the sudden death of her husband, Tessa Barnes finds herself examining a life without her best friend and soul mate. A strong faith in God, a passion to bake, and memories of Great-Grandmother Heart inspire her to open a unique dessert boutique where sharing the love of sweets with that special someone is the chefs special. As Tessas dream comes true, her home and heart are filled with new fr… iends and experiences she never imagined. She watches her daughter go off to college and her brother find love. Through her strength and sharing her love of God, Tessa encourages others to examine their own faith and lifes purpose as they provide support at the trial of the man who killed her husband and assist with bringing Hearts Desserts to life.As opening night draws near, Tessa and her loved ones find themselves in a flurry of fun and laughter while they work day and night. When tragedy strikes again, the future of the boutique and a loved one are at stake. 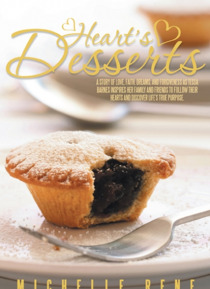 But through love and faith, family and friends prove that anything is possible when the Heart is at the center of what truly matters.Hearts Desserts is book one in the Hearts trilogy, in which God, Grammy Heart, and her family inspire others to follow their passion in finding lifes true purpose.